Super Smash Bros. for Wii U launched in Japan last week. As such, Japanese magazine Famitsu sat down with director Masahiro Sakurai for a chat about the latest entry in Nintendo’s successful series. Some very interesting tidbits were shared, to say the least. One of the topics Famitsu brings up is the inclusion of Duck Hunt. “The original Duck Hunt is a quite major game,” Sakurai said. He notes that the title could be the best-selling shooter game in the world since it was included with the NES in America. Sakurai continues by mentioning that reviving the setting and fun of the original game is one reason to bring Duck Hunt to the Smash Bros. roster. 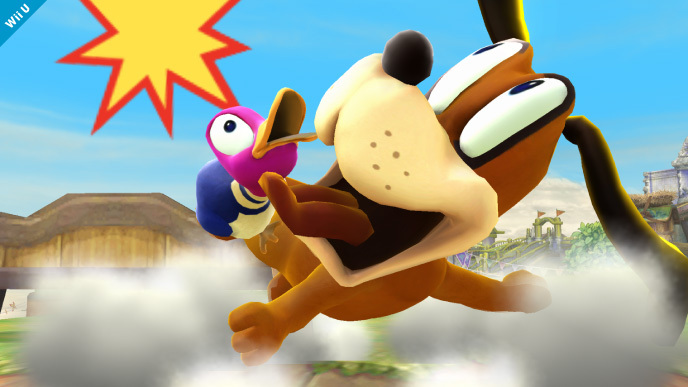 However, he explains that “it is very important how different characters make the game interesting with their individuality.” According to Sakurai, Duck Hunt is something that hasn’t been seen before as there is a third person who aids the player when attacking, mimicking the gun shooting mechanic of the original game. Other interesting comments came about when Sakurai spoke about 8-Player Smash. Surprisingly, he states that including simultaneous 8-player gameplay was declared in a project plan document for Super Smash Bros. Melee. Finally, Sakurai briefly touches on plans for the future in Famitsu’s interview as well. “For now, only the distribution of Mewtwo is decided. Other than that is undecided.” Sakurai adds that production of Mewtwo has just started.